NIA CHARLESTOWN NEVIS (August 27, 2014) –Nevisians have been urged to take advantage of studies offered by University of the West Indies (UWI) Open Campus on Nevis as they seek to further their education. Premier of Nevis and Minister of Education Hon. Vance Amory, made the call on August 26, 2014, at his Bath Plain office, on the heels of a meeting with Head of the UWI Open Campuses in the Federation Mrs. Susan Sarah Owen. “I want the people of Nevis to understand that this is their university and they should take advantage of it, take the option to utilise it because the benefits are manifold and it is so much more cost effective to get your degree here in Nevis,” he said. Mr. Amory noted that their discussions involved matters related to the new school year and some changes that the Administration would like to see to the programmes offered. “Mrs Owen has come over to discuss with us how we can go through this new school year looking at the programmes of the UWI at the Open Campus here in Nevis and what new courses we can do. “One of the things which we want the university to do is to really get out and let our people know that the university is here and it is for them and that it is so much more beneficial if they are able to do their courses here, get a degree, but for us in the Government Service itself, we want to get some skills training in management supervision. I think those are critical for us at this time and I think Mrs. Owens has indicated she is willing to get the university to organise those courses,” he said. Meantime, Mrs. Owen registered the university’s commitment to the NIA to make the necessary adjustments as needed. “Yes, you definitely have our firm commitment to respond very quickly to all of those things that you’ve raised. Those are generally almost exactly in keeping with what we planned for St. Kitts and Nevis throughout the upcoming academic year and far on into the future as well. 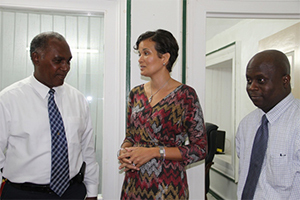 “Raising the public profile of the UWI in Nevis is something that we are very committed to and expanding on the number of programmes that we offer face-to-face in our professional development suite,” she said. The UWI Open Campus Official stated that studies at that facility offered an excellent opportunity to remain on island and study for a degree. “The degree that you get from the UWI Open Campus is the same degree that you get from the UWI St. Augustine Campus, UWI Mona Campus, UWI Cave Hill Campus. Our degrees say University of the West Indies. So it is an excellent opportunity for people who are residing in Nevis, unable perhaps, to travel or prefer to stay home and you can stay at home and work, you can stay with your family and you can continue. “You can reach right on to Bachelors you can go on to Masters and hopefully, soon we will also be advertising that you can go on to the PhD. So I thank you for this opportunity and you have our commitment again that we are going to work very closely with your office, through the UWI Open Campus Site in Nevis,” she said. However, Mrs. Owen used the opportunity to speak of Nevisians were successful at the Open Campus over the years. “I will add that our students in Nevis tend to do really quite well, so we had a featured article last year on one student who will be graduating this year and her mother who graduated last year. “They both did really very well so I am always very impressed by students who balance work and all kinds of other commitments and they still manage to get very high honours degrees. So it is definitely achievable and I am very excited about the possibilities for the future,” she said. Also present at the meeting was Permanent Secretary in the Premier’s Ministry Mr. Wakely Daniel.